In the world of big-time philanthropy, there are many bigger givers. The Ford Foundation gave away $491 million in 1998 alone. 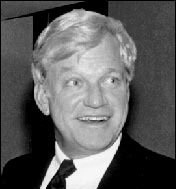 But by concentrating his giving on a specific ideological objective for nearly 40 years, and making most of his grants with no strings attached, Scaife's philanthropy has had a disproportionate impact on the rise of the right, perhaps the biggest story in American politics in the last quarter of the 20th century. Richard Mellon Scaife is in the vanguard of this aforementioned form of this media age political organizing. Scaife uses the $800 million Mellon fortune which he inherited to fund a virtual empire of right wing newspapers and foundations. These newspapers and foundations use their power to control the Republican Party's agenda and viewpoints. [...] In addition to his financial support of purveyors of Vince Foster conspiracy theories, Scaife also is a Newt Gingrich insider -- backing many of the groups that support and defend Newt Gingrich, including contributing $60,000 to GOPAC and $450,000 to the Landmark Legal Foundation. Richard Scaife rarely speaks to the press. After several unsuccessful efforts to obtain an interview, this reporter decided to make one last attempt in Boston, where Scaife was scheduled to attend the annual meeting of the First Boston Corporation. Well. The rest of the five-minute interview was conducted at a rapid trot down Park Street, during which Scaife tried to hail a taxi. Scaife volunteered two statements of opinion regarding his questioner's personal appearance - he said she was ugly and that her teeth were "terrible" - and also the comment that she was engaged in "hatchet journalism." His questioner thanked Scaife for his time. "Don't look behind you," Scaife offered by way of a goodbye. Not quite sure what this remark meant, the reporter suggested that if someone were approaching it was probably her mother, whom she had arranged to meet nearby. "She's ugly, too," Scaife said, and strode off.